With all the excitement of this past weekend’s Royal Wedding, we enjoy and celebrate two beautiful people whose love radiates and inspires us all. It also brought our attention to the relationship of the new Princess and her mother Doria and of course honoring Prince Harry’s beloved mother, Princess Diana. In celebration of our mother’s, we have compiled some beautiful ways for you to honor and include your mother’s, mother-in-laws and grandmothers on your wedding day. The time-honored tradition of having the father give away their daughter at a wedding is not as standard as it used to be. Many brides choose to have both parents walk them down the aisle and over the past few years, we have seen many mother’s walk with their daughters alone. If you still choose to have your father walk you down the aisle, it is beautiful to give your mother and mother-in-law the opportunity to make their own entrance and walk in the processional. Your wedding ceremony is an opportunity to celebrate you as a couple but also the symbolic joining of two families. Asking both mothers to do a reading is a beautiful way to include them in the ceremony. If you are having a bilingual ceremony, one mother can speak in English and the other in the foreign language. They can also take turns reading different passages from the same reading or they can choose to read something they have chosen just for you. Many brides make time to celebrate with their bridesmaids and will include the other women in their lives at their bridal shower. Scheduling a special meal or outing with your mother and future mother-in-law will also make them feel more included. It will also give you all a chance to bond before the wedding day and look forward to future family celebrations. There are so many lists and details that go into creating the perfect wedding day. Having your mother or mother-in-law assist with some of those details will make them feel useful and appreciated. If they love decorating and design, you can ask them to help with choosing colors, decor or flowers. If they love to cook, include them in on menu planning and invite them to your tasting. There are small items like invitations, place cards, etc. that you can have your moms assist with. As we saw in the Royal wedding, Meghan Markle’s mother escorted her daughter on her ride to the chapel. 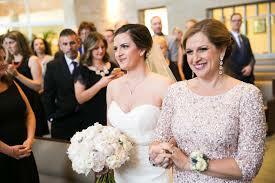 After all, your wedding is also a day that should make your mother’s feel pampered and at their most beautiful. If you are hiring a hair/makeup team for your bridesmaids, you should also offer this same treatment to your mother and mother-in-law. One of our favorite rituals is the Lighting of the Unity Candle. This ritual holds it’s origins in the catholic faith but is also used as a non-religious symbol of two souls coming together to ignite the flame of their marriage. This ceremony is a beautiful moment to invite your mother’s to light your individual candles which represent your individual selves. When they hand the lit candles to their children it represents the gift of life they have given to them and now set them off on their journey together. In many Asian cultures it is custom to present a gift to the parents during the nuptials. There are many ways to also bring this idea to a non-traditional ceremony. Mother’s and grandmothers can be honored and presented with flowers during the ceremony. In recent years, we have also seen many brides choose to also have a special dance with their mothers during the reception. Many mother/daughter relationships are so close that it is not complete unless they share a special moment with their mothers. Prince Harry honored his mother by including many of her jewels in the engagement ring and adornments. It is also rumored that all of the flowers used in the bridal bouquet and bridesmaids were from his garden and were in fact, his mother’s favorite flower, forget-me-nots. Some couples incorporate family garments or jewelry in their ceremony garments or recite a special reading or song played during their parent’s weddings. Photos of your parent’s wedding day is a wonderful way to honor the two families coming together. For the couple who have parents that are deceased, a table or designated area that displays their photos and heirlooms, celebrating and honoring your family member’s memory on your special day. 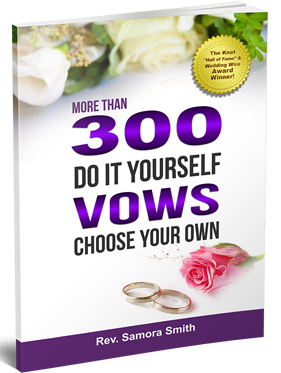 If you are thinking about writing your own vows, click here to check out our guide “8 Steps to An Awesome Vow” and receive a special bonus as our gift to you! Previous Previous post: Wow! This Series Will Make a Big Difference For You! !